Were you gifted a journal before studying abroad? Well.. I will break the news to you now and say that you probably won’t write in everyday like you’re hoping and planning. 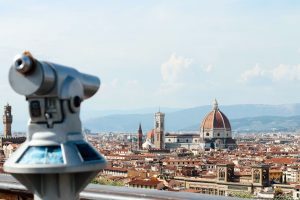 I am an SAI Ambassador who went to Italy with high hopes that I would avidly journal, but if you’re not in the habit of doing so already it will quickly get put on the back burner. The struggle I had with journaling was that I would feel the need to write every detail down which was overwhelming. It is also time consuming! So many people choose to collect postcards from all of their travels. A great idea is to buy a 30 cent postcard and write on the back, in list format, your favorite memories from the day. Ex: date / location / people you were with / funny story or memory / list of the museums and tourists spots you saw here / etc. This way you will have all the important details and a visual documentation. At the end of your semester you can put them in a scrapbook, hang them on a wall, or keep them in a decorative box to go through. You will enjoy going back to read the important details instead of a journal. You’re going to want to remember all the little memories that happen on your big trip! There is an app on phones called 1 second everyday video diary. My roommate, Jen, was very consistent with this. The app makes it easy to upload a one second video and by the end of the semester you will have compiled video with a clip from everyday. When you get back from your trip and your friends and family ask about your adventure you will have a visual to share! Images are a great way to document memories. We are constantly doing so without even realizing it. I met several peers that choose to document memories with an instax that printed instant images or a polaroid and used impossible film. This might be a more expensive option, but it’s always nice holding a photo in your hand as opposed to flipping through a phone. You can paste those instant images in a notebook along with a few notes about the image or memory. This is the journal I brought with me to Italy… I filled out 10 pages which consisted of a solid 7 days. Let’s be real. You can probably type on your phone faster than you can write a page in a journal. A great alternative to journaling on paper is journaling on your phone. It’s easy and convenient for those days you forgot it at your apartment or laying in the dark on your bed. It’s also a good idea to do this anyway to keep track of what museums you have gone to or places you’ve visited. Keep a list on your phone! It’s easier than trying to remember all the places you saw within 4 months after the fact. 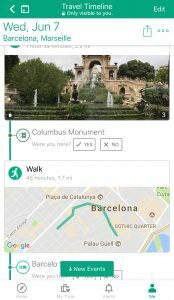 Tripadvisor has a location feature that tracks your movement and activity. If you turn it on it will document the areas you’ve walked, restaurants you’ve visited, and places you stayed. While this won’t keep track of the quirky personal moments, it will take care of the details you’ll forget about and want to know months later. Let me be clear that I have nothing against journaling. If you can keep up with one while study abroad, I owe you mad props! 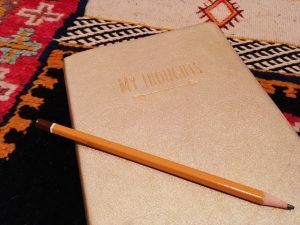 I just wanted to offer you a few alternatives in case journaling isn’t for you. If you have enjoyed these suggests or want to leave a few suggestions of your own leave a comment! Jessica was a fall 2016 SAI Florence student from Georgia State University.